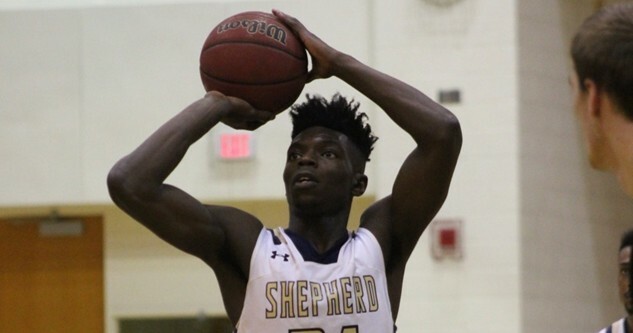 Shepherd junior forward Winston Burgess, pictured here in a prior home game, had a career-high 22 points to go along with 10 rebounds against Urbana. 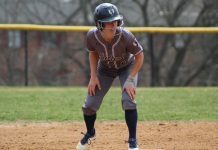 (Photo Courtesy of Shepherd University's Athletics Department). 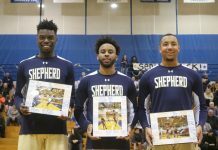 The Shepherd Rams men’s basketball team (10-6, 6-4 MEC) prevailed in overtime in a close battle against the Urbana University Blue Knights (3-12, 2-8 MEC), winning by a 61-58 score on Saturday, Jan. 13, in Urbana, Ohio. The Rams got off to a slow start against the Blue Knights, as they just could not hit from three and missed a few layups. Shepherd shot 9-of-24 from the floor and only 2-for-10 from the three-point line in the first half. This marks a low percentage for Shepherd. Recently, their offense has been looking dynamic and balanced. Junior forward Winston Burgess had a strong first half, as he dropped 17 of Shepherd’s 26 points, grabbing five rebounds as well. Burgess also recorded a double-double the end of the game, scoring a career-high 22 points and snatching 10 rebounds. The Blue Knights, on the other hand, had an impressive shooting percentage from the field in the first half, shooting 65 percent. Urbana was led by junior forward Malik Jacobs, who collected 20 points and nine rebounds. Jacobs made 6-of-15 shots from the floor, knocking down three three-pointers as well. The Blue Knights closed out the first half with a 31-26 lead over the Rams, which would force Shepherd to fight back in the second half. At the start of the second half, Shepherd got the open looks they wanted, but still struggled to convert them into points. Nearly seven minutes through the second half, the Blue Knights went up by 10 points thanks to a successful jump shot by Jacobs, which gave the Blue Knights a 44-34 lead. The Rams would not give up, however. Senior Gavin Mctavish would score back-to-back baskets to give the Rams some momentum. They increased their energy on both sides of the ball, starting on defense, and carryied it over on the offensive end. At the nine-minute mark, senior AJ Carr would knock down a three pointer to cap off an 11-0 run for the Rams, which gave the Rams a one-point lead with a 45-44 score. Carr also recorded a double-double on the afternoon, dropping 12 points and 12 rebounds. In the final minutes of the half, both teams played hard, and came to the realization that the winner was just going to have to want it more. Urbana tied the game at 51-51 with only five seconds left on the clock with a layup by junior guard Roy Hatchett. The Rams failed to answer back, sending the game into overtime. In overtime, senior Steffen Davis would set the tone by getting a steal on defense. Upon getting the steal, the ball was swung quickly to Shepherd sophomore guard Thomas Lang, who then proceeded to drive to the rack, drawing a foul on the Blue Knights. In the final minute of overtime, Carr would give the Rams a 60-58 lead with a layup. On the ensuing possession for the Blue Knights, Jacobs drove the ball to the basket, but missed a layup. Jacobs would grab the rebound and tried another layup attempt, but came up short again for the Blue Knights. Carr grabbed the rebound for the Rams and was immediately fouled with precious time remaining. With the game in his hands, Carr made one of two free throws to stretch the Rams’ lead to three with a 61-58 score with little time left. The game would then end with the Blue Knights unable to get a final desperation shot off, securing the 61-58 overtime win for the Rams. 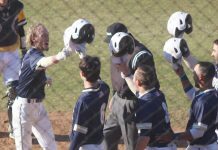 Saturday afternoon’s win marked the seventh in a row for the Rams. Shepherd will return home to face the Bobcats of West Virginia Wesleyan on Wednesday, Jan. 17, at 7:30 p.m. in the Butcher Center.